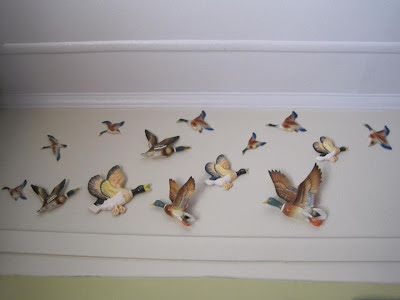 ... many people have three flying ducks on their wall! survivors after others plummeted to the floor. Plenty of space on my wall for more than three ducks! Hope you're having Blogtoberfest fun? Love Love Love your ducks, a whole flock..........do you have a favorite duck? looks like the ducks are having a good ol' party ;) The more the merrier right? an adopter of orphaned ducks - lovely.